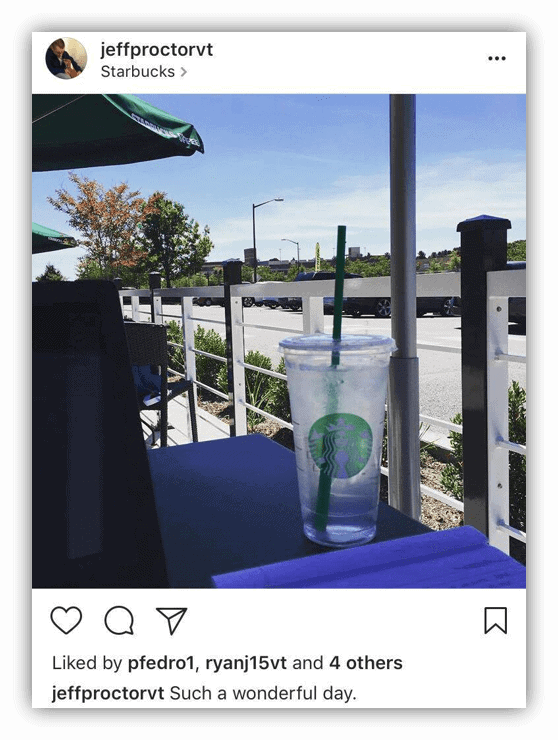 It’s been an exciting summer for Ben and I as we continue to build our blogs and learn more about the online business game. I wanted to give our readers an update of how our business is doing, what’s new with us, and share some pretty exciting changes we have in the pipeline. I share with you how our blog has been doing over the past month, plus some things I’ve learned that can maybe help you do the same, and maybe I can inspire 1 out of every 500 people who land on this article to give the blogging business model a shot. It’s freed me from the 9-to -5 grind that I know so many of you are desperately trying to escape yourselves. And for the readers that already have blogs, hopefully you can learn from our mistakes and make your blogs even better. This income report is not meant to be a brag fest. It’s just meant to show you that earning a living online is possible if you’re willing to work hard and always try new things. Before I dive into our June 2017 numbers, I want to share some background info in case you have never heard of us, or are new to the blogging scene in general. 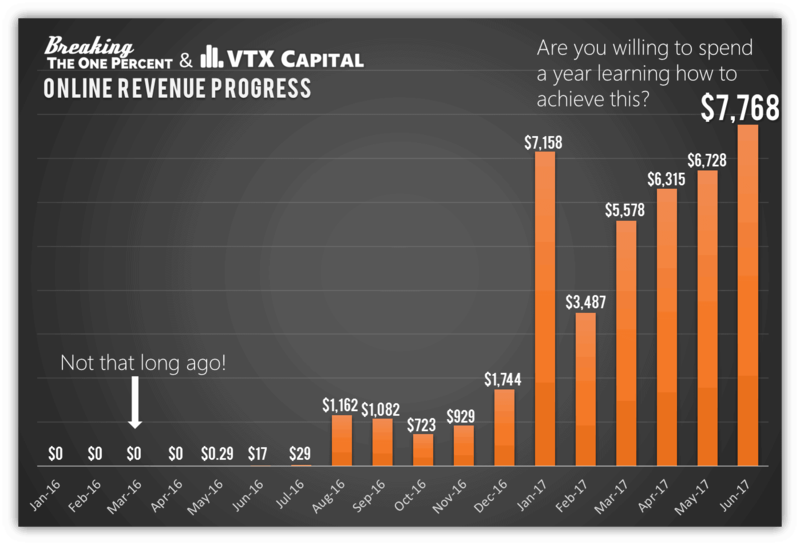 My friend Ben and I have been running the personal finance blog over at VTX Capital (now DollarSprout) for about two years now, and this blog since October 2016. I quit my job working for a financial advisor to pursue this crazy online dream of mine, without having any income stream established yet. (The financial industry is very finicky about conflicts of interest, so I decided what the heck, let me just quit my job so I don’t have to deal with that). I also very much hated the corporate grind and knew I couldn’t do it for another 40 years. Anyway, we started as a subscription-based website for investing tips, but the site has slowly morphed into a full-fledged personal finance blog, where all of our content is free. No subscriptions, no paying customers. 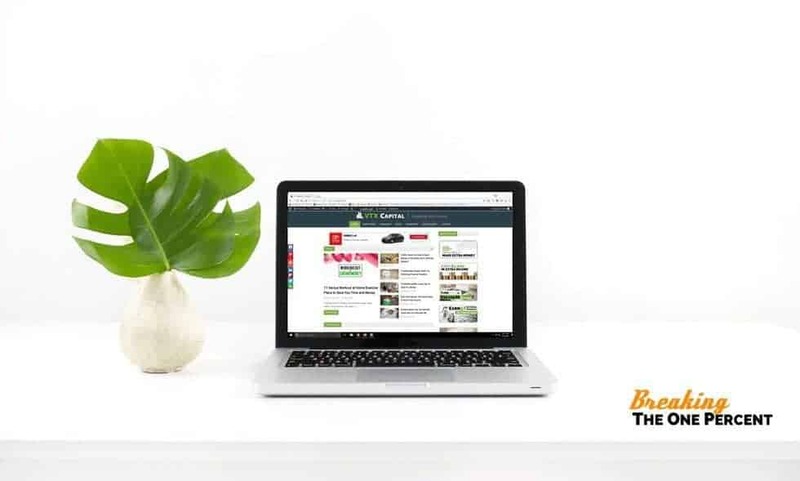 Note: If you want to see our rebranded site, check it out at DollarSprout.com. Since starting VTX, we’ve learned a lot about what all goes into running a successful blog, mostly via trial and error. Like….a lot of trial and error. Completely new to blogging but want to get started? Be sure to check out our step by step post, From 0-$100k: How Anyone Can Start Blogging. You can get started with just a few minutes of setup. 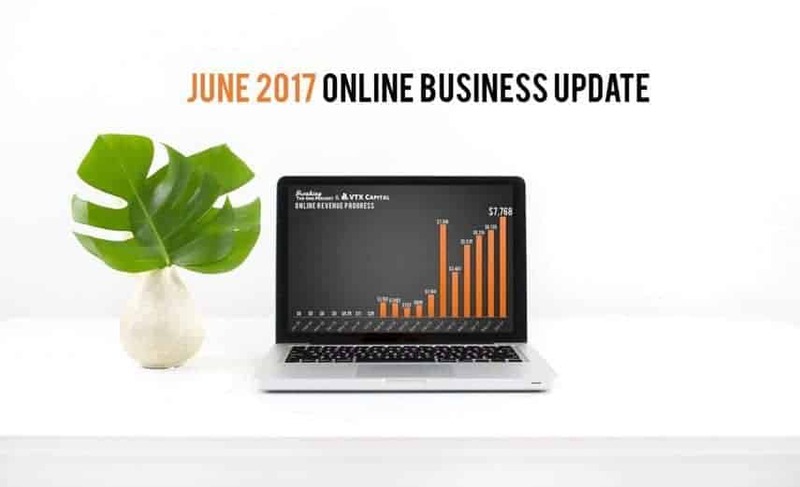 In the 30 days of June, we earned $7,768 dollars online. First things first, this did not happen overnight. And I refuse to lie to you and tell you that it can happen fast. So many online make money “gurus” like to make outrageous claims about how much you can make, how easy it is, how they are sitting on the beach *right now* as they watch the money just pour in…. all in an attempt to sell you their course, their masterclass, their exclusive training, etc. The truth is, making money from a blog is really, really hard. With no business background, no writing experience, no coding experience, and no industry connections, Ben and I have managed to slowly start figuring out how to make our blog successful. What isn’t included in this chart: the twelve $0’s from 2015 when we didn’t have a clue what we were doing. How do we make money blogging? The vast majority of our online income comes from affiliate marketing (a.k.a promoting the products of other companies and getting commissions on sales or leads that we generate). As you can see, all of the companies (with the exception of Hostgator) are ones that help our readers with their everyday money challenges. Saving it, investing it, tracking it, earning extra — all these companies, in some way or another, improve our readers’ finances. Which is exactly why they come to our blog. 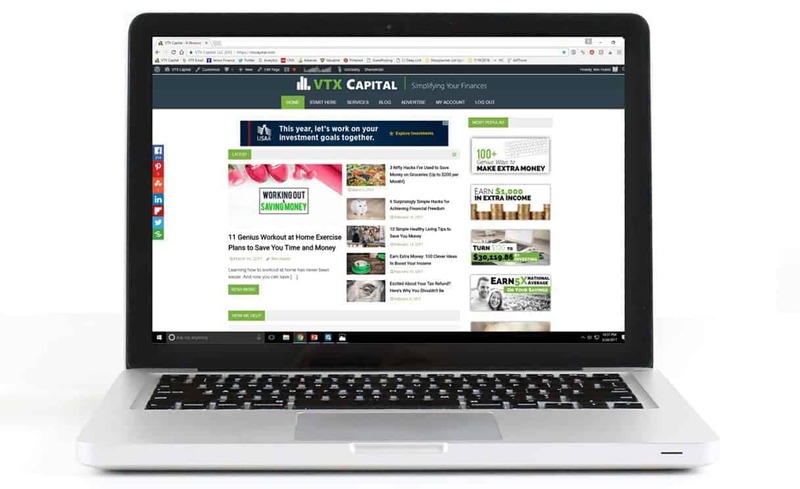 A decent portion of our content on VTX and DollarSprout is geared towards promoting these affiliate companies, while still entertaining our readers and teaching them something new, like how to save $6,000 in under a year. However, we definitely want to get on a more consistent publishing schedule. This is something that Ben and I have been itching to do for a while now, but haven’t made the time to actually do. We made our very first online course! We’ve had a lot of success with using Pinterest to get traffic, and I wanted to create something that would help other bloggers and content marketers hopefully achieve similar results. Because of Pinterest (and because of well-designed pins), we are getting thousands of people visiting our sites every single day. In turn, those readers get great content…and they consume ads, purchase affiliate products, sign up for our email list, etc. Having strong performing pins with great design is the biggest reason why our blog income continues to grow, month after month. I felt compelled to create this course because I see so many bloggers out there with truly AMAZING content but horrific pins that do nothing for driving traffic. I know they aren’t getting the traffic (and thus income) they deserve! That’s why I think so many bloggers end up calling it quits. Anyway, the course is $97. If you want to learn more about it, you can check it out here. In the future, I’d also like to create a writing course designed specifically for bloggers who want to make money from their blog. Writing to sell, without seeming like you’re writing to sell, is a skill that doesn’t come naturally for a lot of people. Ben has also talked about creating an SEO course, but that may be somewhere further down the line. Helping our readers who also happen to be bloggers, while at the same time diversifying our income sources, is something I am so glad we are starting to do! If you’re on our email list, you’ve probably noticed us popping in your inbox quite a bit more often here recently. Why are we all the sudden emailing a lot more? To be honest, we realized we were neglecting our biggest fans! We have nearly 4,000 email subscribers out there, just waiting to hear from us… and we’ve been staying silent. We aren’t going to let that happen anymore. Since we’ve been emailing our list more frequently, the response has been really positive. People are engaging a ton, emailing us with questions, sharing our content more often on social media, and more! And our list is growing faster than ever now, thanks to our new 7-day blogging course and the PDF download at the top of our page. We are getting anywhere from 20-50 new email subscribers a day, which I am so grateful to see. One of Ben’s big projects over the past month or so has been SEO work. Getting traffic from Google is uber important since it’s such high-quality traffic (search intent is a powerful thing). He’s been going back through our old posts to clean up our on-page SEO, plus he’s been networking like crazy in order to build some quality backlinks to our sites. The results are beginning to show; we are now getting around 300 hits per day from Google, which is a huge improvement for us! This is very much an ongoing project though, and we still have a lot of room to grow. Our end goal (and a very lofty goal), is to not be dependent on any one source of traffic. We want to spread out our risk as much as possible! So, I’ve painted a pretty rosy picture of our two blogs so far, haven’t I? Welp, something has actually been holding us back for a while now. Something we’ve really wanted to change, but haven’t yet. Remember, we didn’t start as a personal finance blog. We started with the intent of being a subscription-based investment research company. People were supposed to pay us big bucks to talk about what stocks we liked that month. When we chose the name for our website, that’s what we had in mind — something professional sounding. Something corporate. Something that would make us look “legit” to prospects. Well, it turns out that doing all that technical research, packaging it up nicely, AND marketing it all is entirely too much work for two people. We couldn’t do it all. We weren’t making money, and we needed to pivot. But, as we started to transition more toward the “blogging” business model (because that’s what was really working for us), we feel our name is now disconnected from what we are. The further along we got, the more apparent it became. Outreach and networking is quite a bit harder when it looks like you are representing a corporate entity. Link building, social media engagement/growth, etc… it’s all just harder with the name VTX Capital. People are always initially skeptical of what I have to say. So, we are officially rebranding. And to be honest, I couldn’t be more excited about this change. Starting in the fall, our new personal finance blog will be DollarSprout.com. With the new identity, we want to create a friendly, unintimidating environment where anyone can learn how to be a little smarter with their money. We don’t want corporate and we don’t want serious. We just want to have fun writing about stuff we love. Going through with this rebrand is a huge decision for us, and we want to make sure we get it right. With all of the work involved in making the switch, we want to make sure that DollarSprout ends up being something special. Something different from any other personal finance blog out there. The reality is, that means spending money. The domain name itself set us back $1,400. We then spent several weeks searching for a professional web design team we felt comfortable with, which will end up costing us upwards of $6,000. It’s not cheap, but Ben and I are both confident that this is the right decision for us and our growing online business. When the design team finishes building our new site, we plan to hit the ground running. Scaling our content production by hiring writers, bringing on someone to help with SEO, getting a premium stock photo subscription, aggressive social media ad spend, etc. You can give us a head start by liking our brand new FB page. If you have any desire to give this blogging thing a shot, imagine where you’d be a year from now if you started today. Two years from today. Five years. It wasn’t that long ago that we were making $0. And now we are at $7,768 per month. And, guessing by how July has started off for us, we may crack $10,000 this month. Big things can really happen for you. Remember, we had no online experience, no writing experience, no coding knowledge, nothing, and we’ve already come this far. And we aren’t an anomaly. I really do wish everyone could experience feeling this sort of freedom. Is it easy? Definitely not. Working on these blogs is pretty much all I do, but I love it. Having a full-time job and working for someone else is definitely the safer route. For me, the thought of making someone else’s dream come true while I clocked in and clocked out ate away at me every day I was at work. It finally got to the point where I could not take it anymore, and I left my safe, corporate desk job. The purpose of this article is to show you that it’s possible. It’s possible to build something amazing (even while you’re still working your 9 to 5). To create a sustainable online income stream. To leave your job and do something you love- while working for yourself. The truth is, you can make a lot of money blogging, and you can make money with pretty much any niche out there. Cooking, DIY, Video Games, Yoga…really, anything. I know so many of you are looking for a way out. Well, starting an online business and getting supplemental income may be your ticket. If blogging is something you’ve been thinking about trying, I implore you to take the next step and actually do it. What questions do you have about how to make money blogging? Leave them in the comments! Awesome Month Jeff! You are really starting to do well with your blog income and the $97 pinterest course will be fantastic once that gets going. A quick question: Why aren’t you on Twitter? I want to share this with my followers! Wow this is amazing you guys! What do you think made the income jump so much? Thanks Francesca!! It’s definitely not just one thing- but I think SEO work and tweaking Pinterest here and there has really helped our traffic stay strong during the summer (when it usually drops for bloggers). And I also think we are getting a bit better at writing content that converts. Most bloggers will say “put an affiliate into an article if it makes sense to promote it”, but I would say 80% of the time, I am writing an article with the sole purpose of really effectively promoting a certain affiliate. I think I just put conversions a little higher on my priority list than some bloggers, which definitely goes against a lot of the advice you hear out there on affiliate marketing. You guys inspire me to keep blogging even though the journey to being successful is long and hard! I hope that one day all of my hard work pays off too! I think one of the things Jeff aimed to share with this income report was that whilst blogging can be a profitable, it generally requires a ton of man power/work hours to achieve it. No disillusioning people with the whole “you can have a 5-figure/month blog with just 1 hour a week stuff”. Generally speaking you have to put in insane hours for a number of years before things start to click. Not to say it can’t be done faster – and with less work – but those types of successful bloggers tend to come from very specific tech backgrounds with some sort of marketing expertise to begin with. We had none of that, did it in about 2 years, and so can a lot of you. That’s the point he wants to convey. First of all, congrats on your month. This is what I can only hope to make with my blog. Second of all, thanks for voicing the fact that ‘gurus’ claim that you can make money easily or quickly to make you buy their course and 9.9 times out of 10 you end with nothing to show for, and a huge chunk of money lost. I wrote a post sort of like the same but based on online freelance websites. Third, did you join these sites through affiliate networks or each through their site? Seeing results like this as a new blogger is super inspiring. It’s a long road to get to where you are now but the payoff is amazing. Keep up the good work! Less than a year and already over $7000, even another $7000 month a few months back. Awesome progress Jeff. I see a lot of blogs come and go, and one thing that the more successful blogs seem to have is 1) consistency 2) a personality/brand/identity 3) good content. Keep it up. Thank you! If we can do it, then I am convinced that most anyone can! Just takes a lot of hard work and consistency, as you said. Found your pin on my pinterest feed and decided to come check you out. I love how you emphasize the whole work that goes into blogging. Congrats on your new domain and income increase. Great tips. Thanks for this and wish you continued success! Congratulations on your blogging journey! Also, I’ve noticed that Vtx Capital has also articles that are not related to personal finance but to fitness as well. How is this working for you? Did you see increase in traffic by doing this? We do! That was more of an experiment than anything else; Ben and I have toyed with the idea of starting a fitness blog at some point. We’ve gotten decent traffic from the fitness articles, but obviously we dont write a ton about of fitness content since it’s not exactly in our niche. “Excellent content but terrible pins…” I didn’t know you read my blog! In all seriousness, thank you for sharing your income reports. They are motivating to those of us stuck in the lower left of your earnings chart! Hi – love the blog thanks for sharing. Can you please share your pinterest account so I can follow you? Thanks! Thank you kindly – will check you guys out on there!